Don't be left in the dark due to a power outage when you work with the team at M.J Electric in Hinesburg, Vermont. We provide electrical repairs for anything from cables to circuit breakers. Unlike other companies, our goal is to help you understand the risks and reasoning behind our services. With our focus on electrical safety, you never have to worry about a faulty fuse causing a problem in the future. The safety and legality of your system depends on quality service from your technicians. When you work with us, you are guaranteed personalized attention during your job. 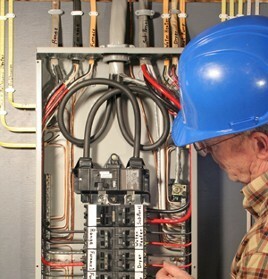 Contact our technicians to request electrical repairs in your building.